Check out the latest edition of the Official Arsenal Magazine for a “Summit Special” – a story regarding my relationship with Arsenal and the journey of two Arsenal flags on my Seven Summits project. One of the flags accompanied me to the summit of Vinson Massif on Antarctica, the highest, driest, windiest and coldest continent on earth, as well as to the summit of Cerro Aconcagua, the highest mountain in South America. The other followed me to the top of the world, the summit of Mount Everest in Nepal, as well as to the summit of Denali / Mount McKinley, the highest mountain in North America. 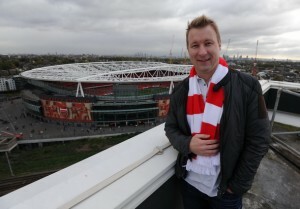 The flags will be auctioned for the Arsenal Foundation at the Charity Ball towards the end of the season. 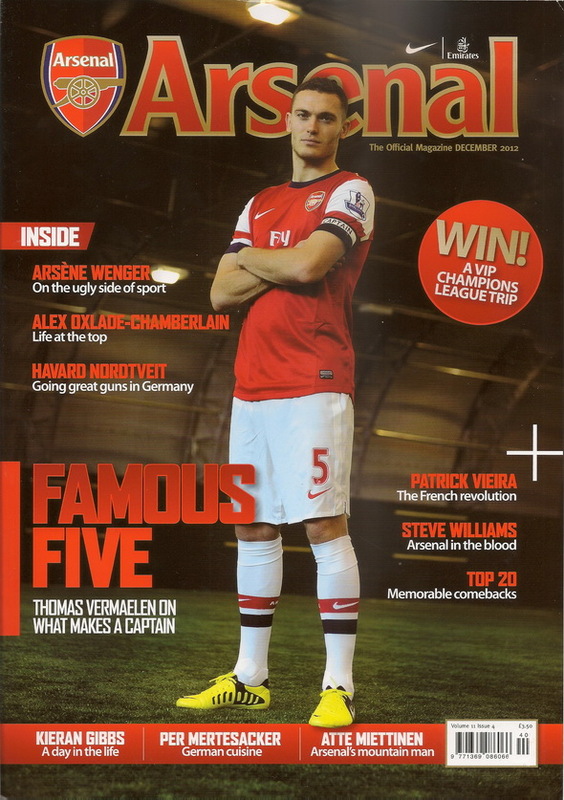 If you’re interested in bidding for these unique items, please contact the Editor of the magazine at magazine@arsenal.co.uk. I got a nice message this morning from my friends at Arsenal Football Club. They sent me some of the pictures bringing up memories of the great day at Emirates Stadium a couple of weeks ago. I carried a couple of Arsenal flags on my Seven Summits expeditions, which the team will be auctioning off for charity. Arsenal also wanted to share the unique journey of the flags and created a short video regarding me and the journey of the flags, which will be available on www.arsenal.com next week, so keep an eye out for that! We shot material for the video on top of a nearby apartment building which gave us a beautiful view over the Emirates Stadium as well as the rest of London. 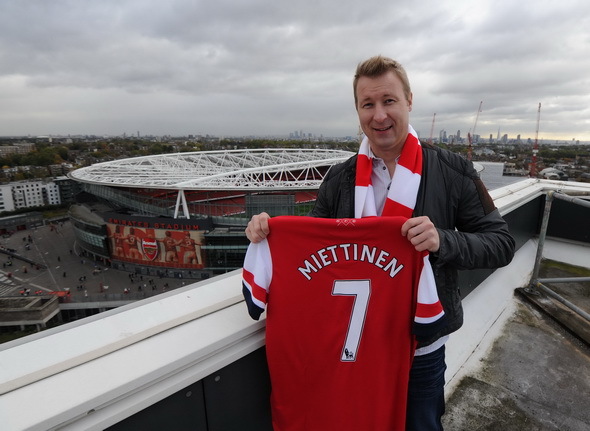 The club also presented me with my own official Arsenal FC shirt with number 7 for the Seven Summits. I bet Tomas Rosicky will be surprised when he returns from injury and finds out his number has been reallocated! 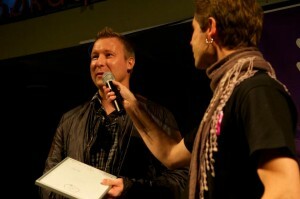 It’s Official – I got the Certificate! I received good news in the mail today. The Nepalese Government finally sent my Summit Certificate for Mount Everest or Sagarmatha as its stated on the document (Sagarmatha is the Tibetan name for Mount Everest). I never used to think much about certificates, but some years back on a trip to Africa, a local man stopped me after a hot air balloon trip over the Savannah and said that I should wait and get my certificate. I said, “I don’t think much of them” and he answered: “how are you going to prove you were ever in a hot air balloon if you don’t have a certificate?”. So, there you have it. You gotta have one! The leading Finnish outdoor magazine, Retki, which basically means “trip” or “journey” recently published a story regarding my Seven Summits journey titled “Snowman and the Seven Giants” in the theme of snow white and the seven dwarfs. I’m obviously not much of a snow white, but the article is great and if you’re a Finnish speaker and haven’t had a chance to pick up the magazine, then you can see the article here. I was the guest of honour tonight at Murdoch University’s first ever Alumni Reunion in Dubai along with His Excellency Mr Pablo Kang, Australia’s Ambassador to the UAE. 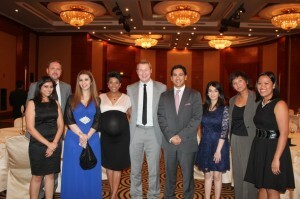 Murdoch University Dubai is a branch campus of Murdoch University in Perth, Western Australia. The Dubai Campus was established in 2008 and today Murdoch University Dubai is the 6th largest university in the UAE. 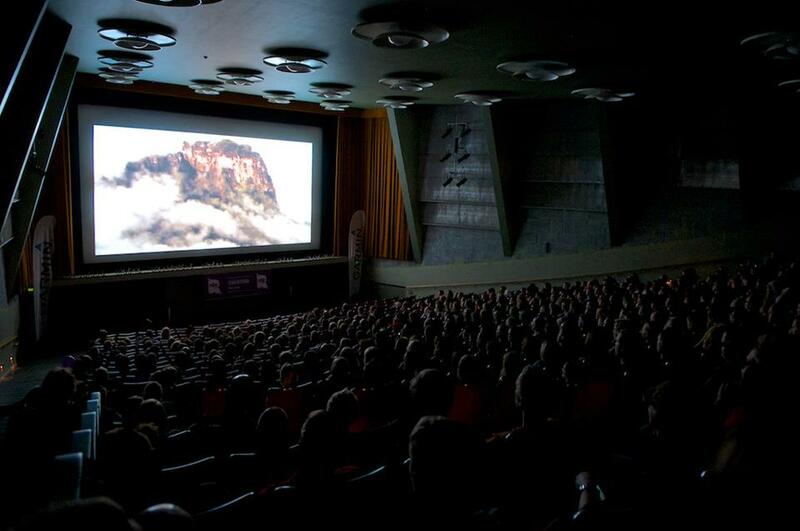 Murdoch University recently put together an awesome video for me based on photographs and videos taken during my expedition to Mount Everest this spring. This evening it was my time to return the favour by delivering a short speech to the alumni regarding the thinking big and aiming high, finding the courage to follow your heart, and making your dreams come true. 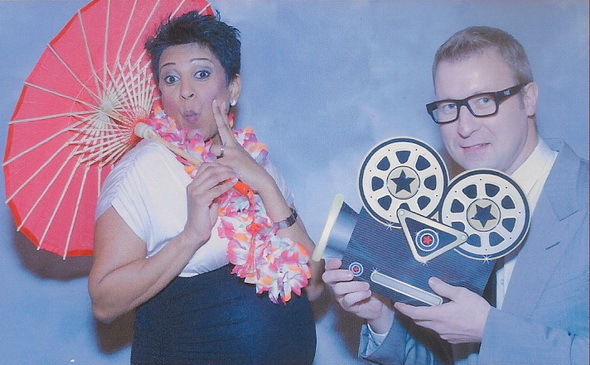 My wife Delanii also joined me at the event and we had a lot of fun. Aiming High with Arsenal FC! 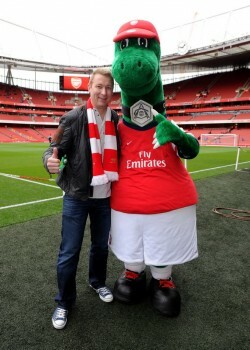 I had a great day visiting Arsenal Football Club at Emirates Stadium today! I carried two Arsenal flags on my Seven Summits expeditions: one came with me to the summits of Vinson Massif on Antarctica and Cerro Aconcagua in Argentina and the other one, to the top of Mount Everest and Denali / Mount McKinley. I handed over the flags to Arsenal FC to be auctioned off for a charity and the Arsenal marketing team used the opportunity to create some material for their media channels as well (I’ll post these up as soon as they’re available). We got some pictures of me holding one of the flags at the roof of a nearby building, which gave us a stunning view of not only Emirates Stadium but also London! 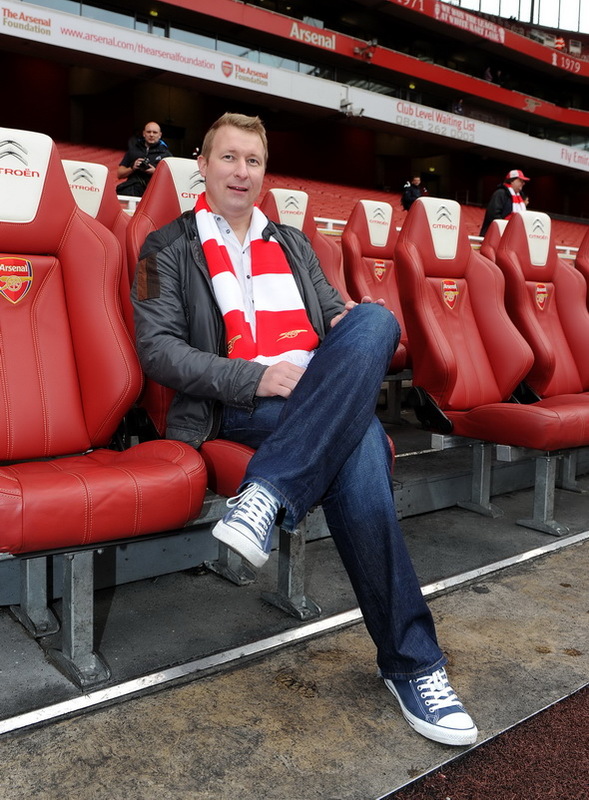 Then we took some pictures in the stadium and the pitch – I even found myself sitting on Arsene Wenger’s seat on the sideline, but forgot to leave him a note with some tips for the game! 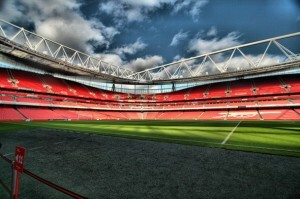 The day was crowned with Arsenal winning a tough game against QPR 1-0! 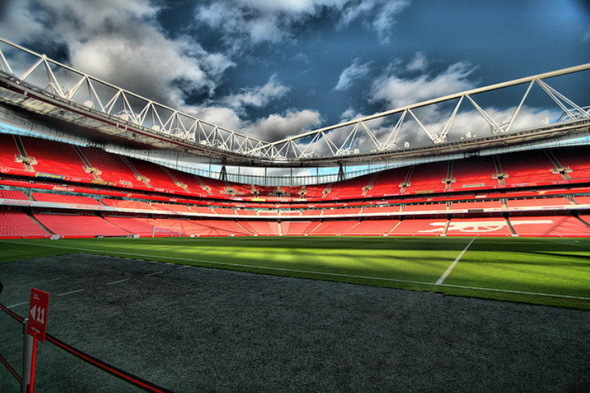 Big thanks to Arsenal FC for hosting me! 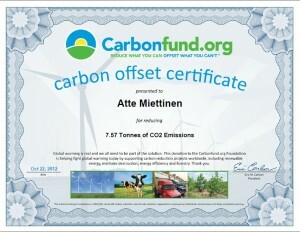 I just finished offsetting the last of my Seven Summits project’s travel related carbon dioxide emissions. 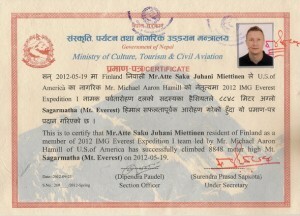 My First Finnish Seven Summits project took me to all seven continents over a period of several years, although the last five mountains were climbed during a period of just 13 months. The project was a great experience and I would recommend everyone to take advantage of the numerous beautiful places on this planet. 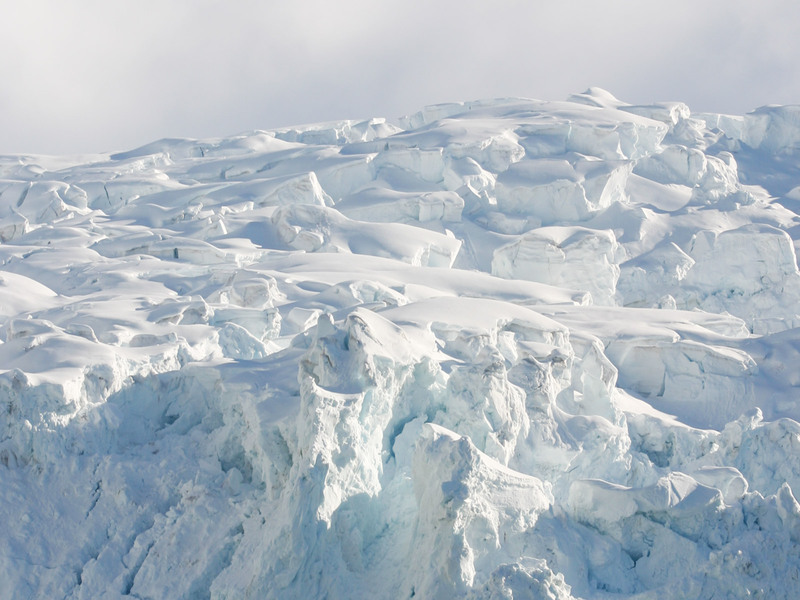 However, I would also encourage everyone to also be considerate to the negative aspects of travel and in particular the carbon dioxide emissions. In order to continue exploring the world with a clear conscience, I wanted to offset the carbon dioxide emissions related to my travel and would encourage others to do the same, so that we can continue to admire the natural beauty around us. In order to complete my project, I had to take 46 flights and cover approximately 137,453 miles in a combination of planes and helicopters. 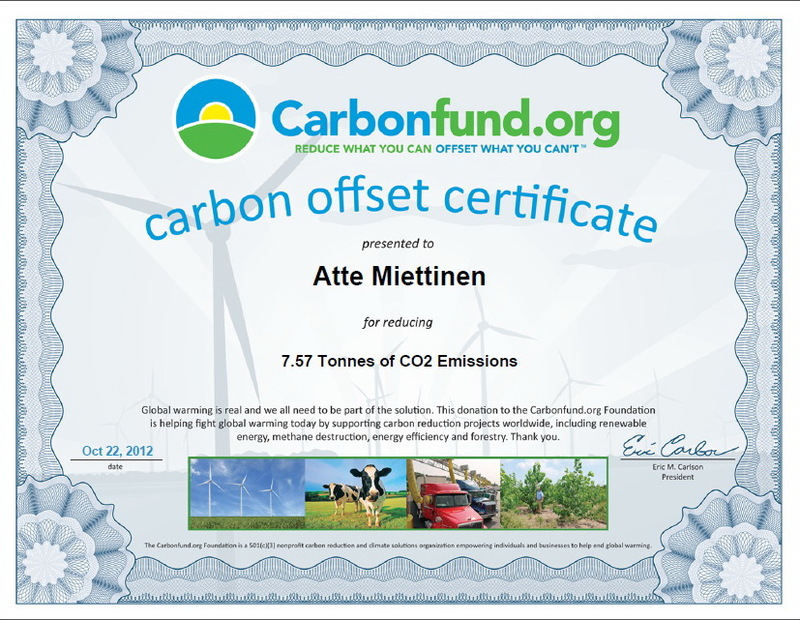 I’ve now offset the emissions related to these flights by making a donation to Carbonfund.org Foundation, which will invest the money in projects creating 26.51 tonnes of carbon offsets. Buying the carbon offsets is easy as there are a lot of companies offering the service to both companies and individuals. Figuring out your carbon dioxide emissions is a bit trickier, but fortunately most carbon offset companies provide calculators enabling individuals to calculate their carbon dioxide emissions for example related to driving, flying, living etc. 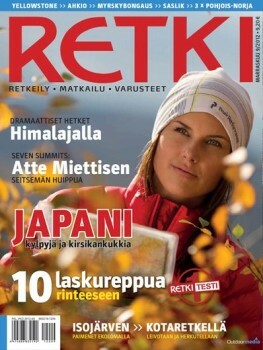 My First Finnish Seven Summits project was recognised tonight as the Outdoor Achievement of the Year in Finland. The selection decision was announced at the Helsinki Adventure Night event in central Helsinki, which is quickly becoming the must-attend event of the Finnish outdoor scene. 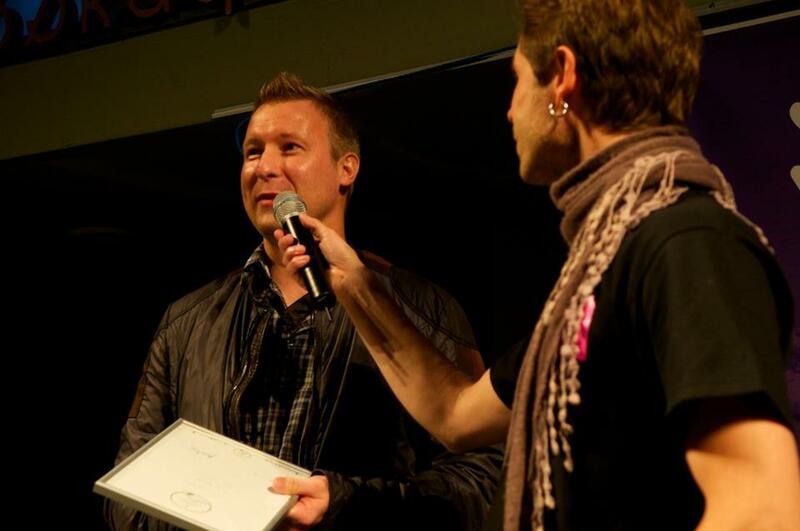 The award was a great honour and recognition both for Finnish mountaineering as a sport as well as my project, which has taken my full focus for the last 12 months, so it was a great feeling to be recognised! I got an early start to the day as I was invited to visit Huomenta Suomi, which means “good morning Finland” – a morning TV show on MTV3. 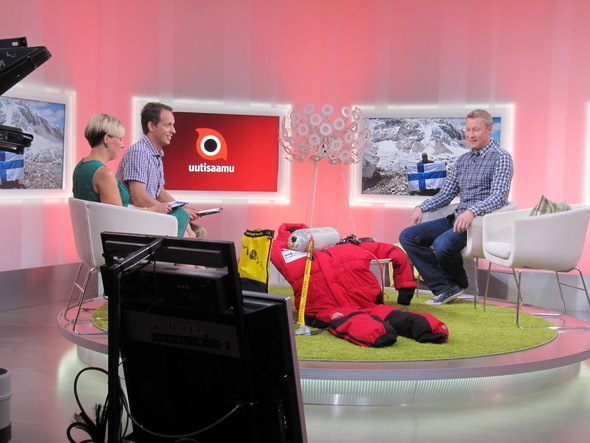 I had visited the program back in March, before heading to Mount Everest, so it was great to get a chance to tell the story of my Everest expedition to the Finnish viewers of the show. You can see the interview here. After the show, I visited Veikka Gustafsson, a Finnish mountaineering legend, who climbed all the fourteen mountains higher than 8000m without oxygen! The next two days are all about radio! I kicked-off this morning with a visit to Radio Helsinki, where I had a chat about my expeditions with Harri and Tuuli. 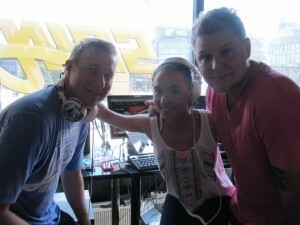 In the afternoon I headed to SpinFM, where I was interviewed by Vesku and Jutta.